2 What types of ladders are difficult to move? An important tool one needs for their home is a ladder. Aside from its uses for construction, a ladder is like having a bicycle; it must be in any household’s backyard or garage when needed. Ladders have many uses at home like in making simple repairs at some high points at home. Say when fixing the roof or ceiling, or when re-painting walls and other areas than cannot be easily reached. It can also be used when cleaning the house, some homes have high ceiling and comes with it the necessity to maintain cleanliness by dusting or removing spider webs that got stuck through time. Some houses also have built-in ladders for their attic wherein it is attached as an adjustable stairway. For those who love trees and gardening, having a ladder nearby is also a useful gardening tool. For instance, trimming tree branches or picking fruits from tall trees may not be easily done by just climbing it; hence, by using a ladder, doing so makes it faster and safer because it acts as a support in this kind of activity. When one has a mini library at home, using a ladder for the book collection can add design and impression on the type of person one is. In household with big kitchens, it is also advisable to use ladders to reach topmost cabinet where stocks or utensils may be stored. Another common use of a ladder is for bedrooms with double bed frames and which are usually found in children’s rooms. Children love activities and having something they can climb on during bed time attracts them to stay in bed to sleep or play. One trending type of house is a tiny house, some six feet wide and 10 feet in length size are now becoming of interest for families because of its practicality. And in these tiny houses, ladders are often used because it helps maximize space and is a recommended stairway. Aside from its use at home, ladders are also commonly used in the office. Mostly repairmen for air-conditioning units or maintenance guys are the ones seen carrying ladders for certain repairs to be done in offices. Some offices have also seen the use of ladders in emergency cases, say for instance, in case of fire. And in which office can one see as many ladders as there is possible in one workplace? In fire departments, of course, ladders in this kind of profession are a necessity because it is used in all instances from fire trucks to climbing houses or buildings on fire. Now that the uses of ladder are discussed, it is time to make an analysis the mobility of ladders. What types of ladders are difficult to move? Ladders that are difficult to move are usually the ones attached to a concrete or stable edifice or structure. Usually, these immovable ladders are intended to become permanent part of a structure where its use is necessary to achieve the purpose of the said structure. One type of said ladders is the attic or loft ladder which is commonly used in households. 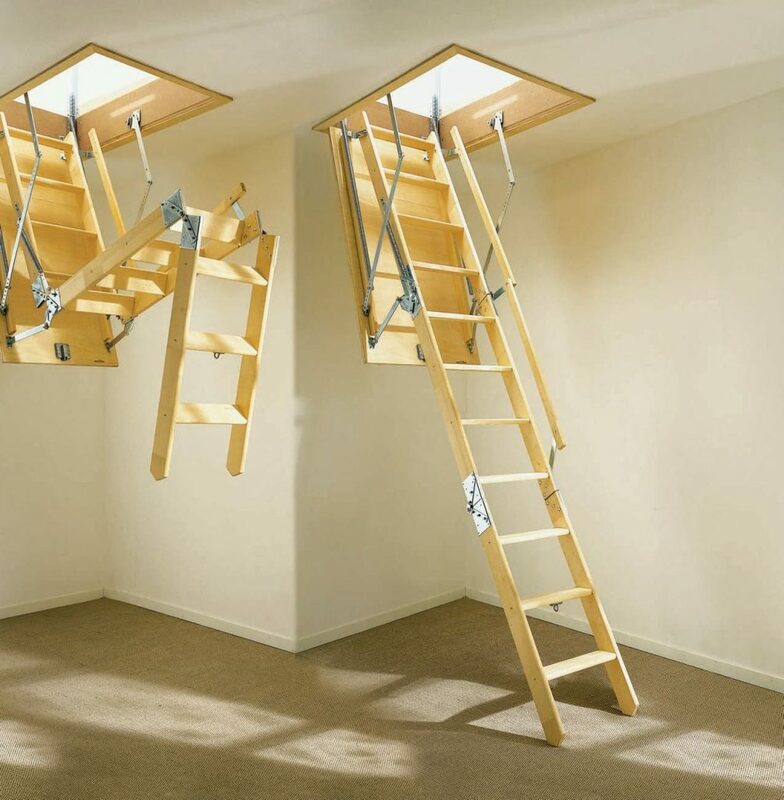 Often, this type of ladder is attached to the main entrance of the attic or loft and easily slides down and unfolds whenever used. In the United States of America, for instance, some houses still use this type of method for their attic or loft because it saves space and are practical since the attic or loft spaces are not places where household members usually stay. Another type of an immovable ladder is a dock ladder which can usually be found in ports, wharves or harbors. This type of ladder is used mostly by fishermen whenever they arrive or dock at ports wherein such ladders are attached to the wall partitioning the land area from the sea. 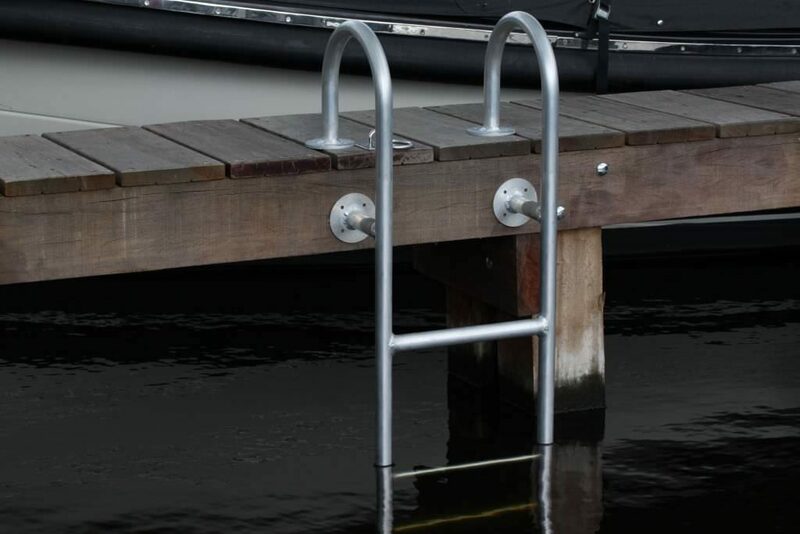 Dock ladders are usually made of metal and are attached permanently to a wall wherein boat crew members can easily climb through. Escape ladder is also one type of ladders that are immovable. It is usually used, from the term itself, for fire escape. It is usually attached to the walls outside of the building or structure from the topmost level down to the ground. It is also usually made of metal that are foldable and adjustable. 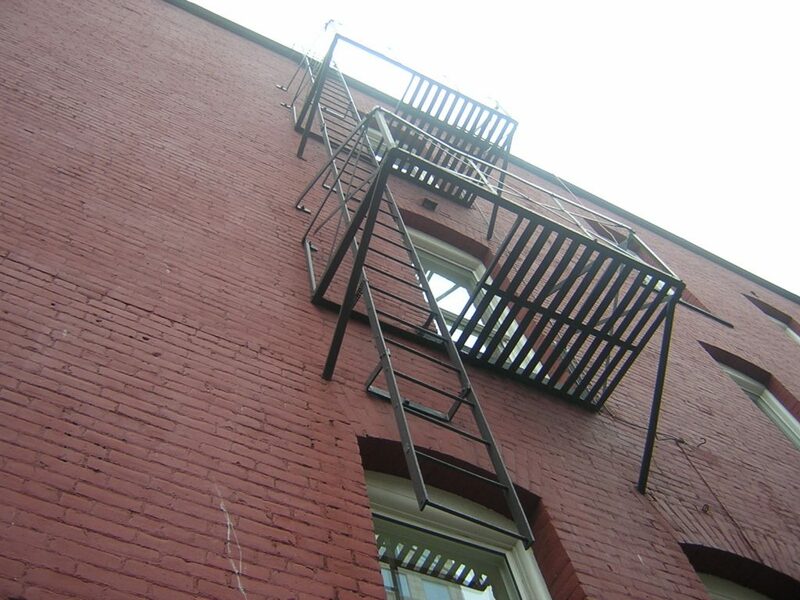 Often, the ladder is elevated and folded in the level before reaching the ground so as to prevent burglars from using it as entrance to the building. In some libraries, ladder is a necessity and is usually movable. 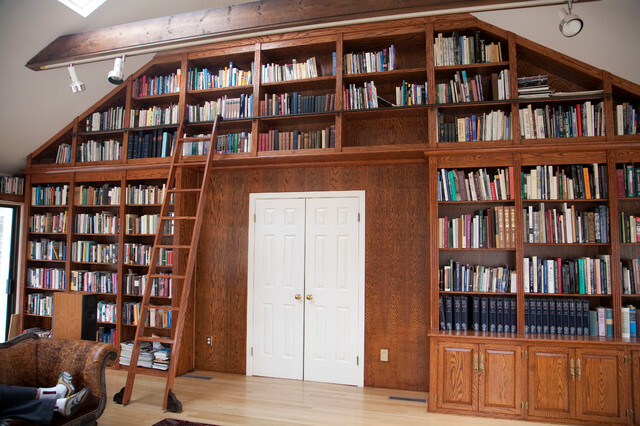 But for some libraries, in order to save space, permanently attach ladders for their readers to the shelves and cannot be removed without damaging the structure. This type of ladder is often used for libraries with second levels only and with usually smaller high area to accommodate readers. It is but practical because the lesser people who use the ladder, the lesser maintenance it needs. One way of making a ladder easily movable is by using a roller or wheel at the bottom leg part of the ladder. To make the ladder stable when used however, these rollers or wheels can be folded or removed and re-attached again once it needs to be moved or stored. Rolling ladders can often be seen in libraries where readers use it to adjust and climb on shelves where the books are located. Aside from rollers or small wheels at the bottom part, some ladders are foldable to the size that one can hand-carry them. To make foldable ladders, the size of the ladder is divided and cut into parts and are attached with screws that can aid in its foldable feature. Usually men who carry these foldable ladders are construction men or building maintenance men wherein ladders are a necessary tool for their job. Some benefits of using a movable ladder is that it can be transported from one place to another without limiting the purpose of its use. For instance, having a foldable ladder at home may not be used only to make house repairs on ceilings or roofs because it can also be used in gardening. Treetops may not be easily reached to trim branches or pick fruits and may require one to use a ladder for safety reasons. Constructions outside home, like in the backyard, may also require the use of foldable ladders to reach high areas.